Neil Price naturally discusses this passage in his excellent book on seiðr, "The Viking Way." The Greenland seiδkona was probably seated in the high-seat of the hall when she arrived out of respect, as any important guest would have been. The next day, when she performed her seiðr, she was seated on a "seiδhjallr," or "seiðr-platform." No description is given of this, but it was apparently not the same as the high-seat. The spirits were summoned to the Little Vǫlva, she did not journey out to find them, as a shaman might have. Finally, as you may have noted, the spirits were summoned by a single woman's chanting -- but it was not the Little Vǫlva. Rather, she recruited one of the household women to perform this function (somewhat against her will), while the seiδkona sat quietly and observed what was transpiring in both worlds. And of course, no runes are mentioned anywhere in this passage. It would be groundless to suggest that this describes the procedures to be followed for a runic divination ritual. I suspect that the introduction of later day re-invented Harner core shamanic practises has been introduced into modern re-constructions of oracular seiδr on the basis that Ynglingasaga mentions that Odin has the ability of hamfarir taking vague descriptions of this from the Finns Sami noaides. Elements of Finnish mythology survived within the oral tradition of mythical poem-singing and folklore where examples of their "trance" shamanism have been adapted from. 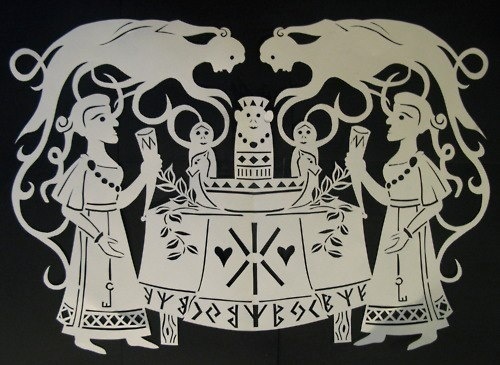 My understanding of indigenous Siberian shamanism is that this art and term shaman is unique to Siberia and not universal but in particular, a way of life as you grew up with via a mentor using the oral tradition from childhood. Real shamans and historical shamanic practices is and remains a way of life, not a weekend pastime. Consider also that shamans actual always belonged to a tribe---something so lacking in modern recons of the art. You cannot in my opinion having researched and met such people during my travels for the past 30 years live out a life in the office by day and become a shaman powerful at the weekends. This is the crust of what many today who call themselves "shamans" basing their "knowledge" on poor information that they have read up on or attended one of the many "Core-Shamanism New Age courses" at places like Glastonbury in the UK and elsewhere in the USA. The rune circle casting that they use is adapted from elements within the "Hammer Rite" and comes straight out of Thorsson's Futhark, A handbook of Rune Magic. Historically speaking heathen holy ground was not created or identified in that manner as you probably know.